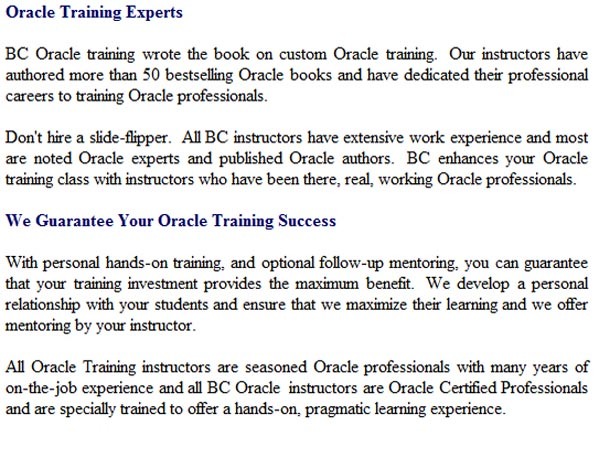 Burleson Oracle Training has been conducting Oracle training for 23 years and has developed an outstanding Oracle training curriculum covering all areas of Oracle training. Burleson Oracle training courses include Oracle training in Oracle tuning, Oracle training in Oracle SQL tuning, Oracle training in Oracle database design, Oracle training in Oracle Data Warehouse. We also offer Oracle training for DBA, Oracle training for Developers, Oracle training for end-users and customized Oracle training.